Home > Behaviour > What is an Anti-Social Behaviour Order? Many of us are now familiar with the term Anti-Social Behaviour Order, but what is it designed to do and under what circumstances is an ASBO issued? An Anti-Social Behaviour Order (ASBO) is a legally binding agreement between a person or persons who have committed acts of anti-social behaviour and the police. Originally implemented as part of section 1 of the Crime and Disorder Act 1999, ASBOs are designed to reduce the likelihood that an individual will reoffend. ASBOs can be issued to adults and children as young as 10 years old. An ASBO will be issued if the individual in question is charged and taken before a magistrate. At this time a magistrate – who may also hand down a sentence of community service or a fine – will instigate proceedings to have an ASBO put in place. This agreement must be met on all counts by the individual and failure to do so can constitute a break in the agreement, which in itself is considered to be a criminal offence. The issuing of such an order can also come with a curfew which states that the individual must not be in or around a particular area after a designated time in the evening. 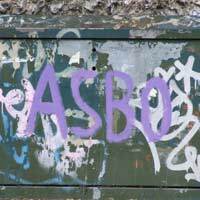 The ASBO may also determine that an individual must not have contact with a designated number of individuals, all of whom can be issued with ASBOs themselves if there is a degree of certainty that they will cause further anti-social behaviour as a group. Such a break in the conditions as laid down by a magistrate can result in the individual being returned to court where a harsher punishment may be imposed. In some cases, the punishment may include a custodial sentence to be served in a Young Offenders institution if the individual is not old enough to qualify for time to be spent in the adult prison system. For more information about Anti-Social Behaviour Orders, contact your local Youth Offending Team or community police officer.